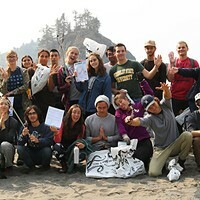 First of all, thank you Joe Abbott for your inspiring story about the genesis of your coastal clean up escapades ("Beach by Beach: The Humble Humboldt Roots of the World's Largest Coastal Cleanup Event," Sept. 6). Beach addicts like us are hooked on pleasures such as watching multitudes of migrating shore birds, looking out for whales and dolphins, greeting dog walkers and fishermen, families and children, breathing in the fresh ocean air and seeing what the Pacific has washed up on the shore. However, a few weeks ago we ventured north toward Lanphere Wildlife Refuge and started to see piles and piles of black plastic garbage bags heaped on the foredunes. It looked like they had been there for quite a while and had begun degrading in the sun and salt air. We counted at least 100 before we turned around. We considered taking some of them back with us strapped to our saddles to dispose of them properly, but they were full of plants. Maybe poisoned plants. Two years ago, in this same area, the Department of Fish and Wildlife had sprayed an herbicide cocktail on dune plants without any public notice whatsoever. The plants were then stuffed in plastic bags like these and left for months. Was this the same situation? We didn't know. Picking up dirty diapers is bad enough, bags with plants possibly coated with cancer-causing herbicide gives one pause. The hypocrisy is this same public agency that piles up degrading garbage bags filled with poisoned plants on public land also sponsors beach clean-up days. Ocean Day, originally meant to be a clean up the beach day, has become tearing out dune plants day. A day where children's labor was turned into matching funds for a nonprofit. But don't worry, Joe, as long as we don't get poisoned, I and many others like us will keep scooping up the garbage left by the inconsiderate.